Adriaen Brouwer's work was as colorful as his personality. He defined a new genre of painting and his style looked to recreate the psychological aspect of the moment, just as Hals had done in his works. His brush work and subject matter reflected the harsh realities of life in the low- lying provinces. Brouwer very much confronted reality for all its absurdities and depicted what human nature was really about, without the conformity of social restrictions and concepts of proper conduct. Despite his unique subject matter and messages, his works were popular amongst the Dutch market as they denoted a natural facet of society that was deemed immoral. Brouwer completed a total of 130 works including sketches. These form the crux of Brouwer's work and gained him popularity in the Netherlands and Flanders. He would frequent the taverns wherever he stayed not only for his own pleasures but also for inspiration. 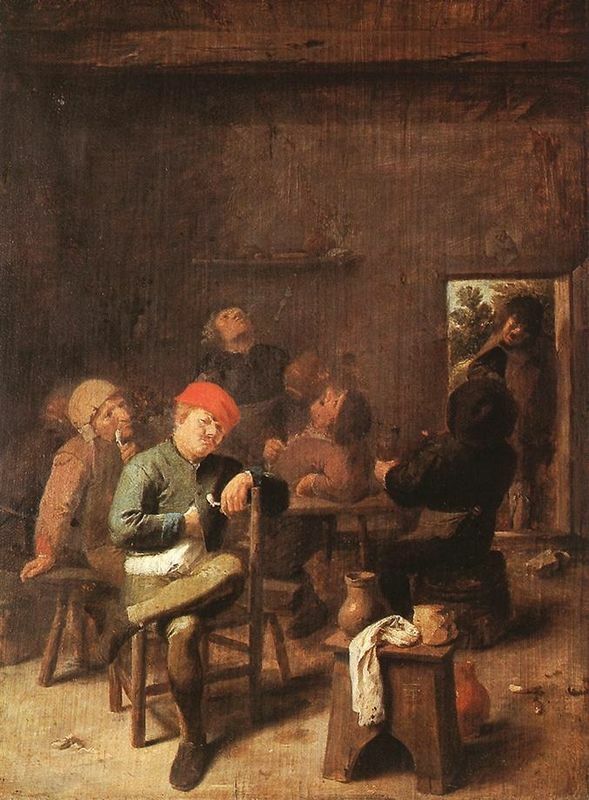 Brouwer's tavern scenes were popular for their crass nature and many of the wealthy Northern societies liked these works as they could look down upon the insanity of the common folk. The Dutch favoured them as it they closely represented reality and were a change from religious paintings. Brouwer was an excellent draughtsman and his landscapes were most noted for their romantic and sketchy style. 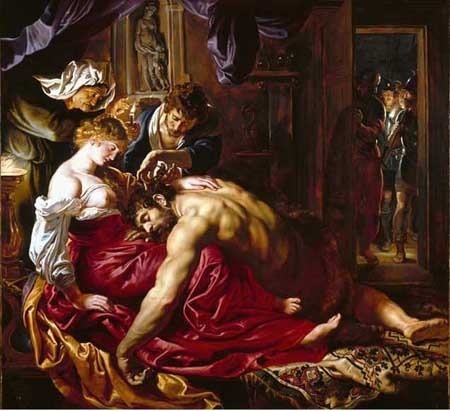 They were not executed in fine detail but could took on a lot of characteristics similar to Rubens in their hazy painting style that recreated the atmosphere of the scene. 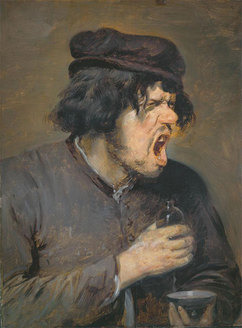 Brouwer's portraits were mainly personal works done by the artist of random and common folk that he met in taverns, as well as depictions of himself. It seems he only chose subject matter where he could portray the most character traits such as with friends or odd looking individuals. Brouwer liked to present the sitters at their most natural, elevating their honest psychological rendering using iconographical aspects. Like his contemporaries, Brouwer would first sketch his works on sheets of paper and then execute then upon the canvas in paint. Many of his sketches are works in their own right. They were rough and executed quickly as he tried to capture a brawl or event as it happened, usually under the influence of alcohol. This approach to painting was somewhat unique. Brouwer's sketches were mostly made using black charcoal or chalk, depending on his budget. They were often scribbled down as he tended to smudge parts he thought most necessary for chiaroscuro. Sometimes he used the conventional water and ink medium like Jordaens, which helped create a more fluid image and one where the ink was much finer and allowed for more detail and movement. 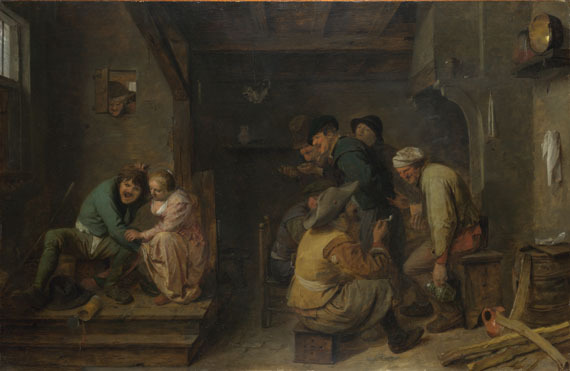 Adriaen Brouwer used an array of warm and bright colors to help liven up the dim lit scenes in the taverns. He often used red and yellow to highlight his deep composition and to create a focus on the main subject matter. His colors can be described as velvety in nature as he looked to recreate a warm and smoky atmosphere. He blended all of his colors with a final over layer of brown to bring all of the colors together and ensure this smoky haze. He also painted white very thinly over the whole work especially over the dark shadows to create the right atmosphere. Brouwer's palette contained various browns, light pinks, greens, creamy yellows and oranges. He used black and greys in his works for chiaroscuro techniques to produce a better psychological rendering of his scenes. He also opted for blues and mixed these strongly with grey and white to accentuate people and objects that needed to stand out in the canvas. Blues and greys were also evident in the background and floors to add depth to his works. 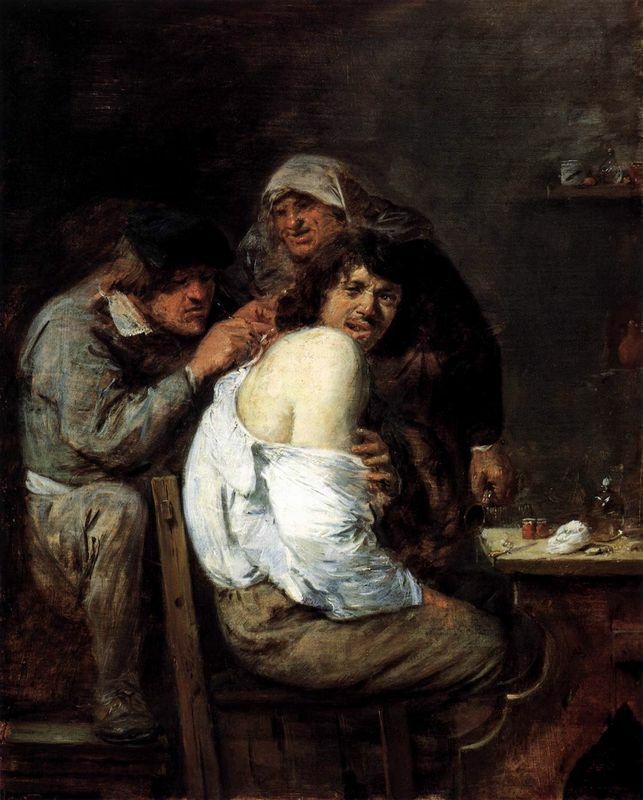 Brouwer's flesh tones are distinct as his use of shading for them is more blended than that of his master Frans Hals. His shading on his subject's faces and skin takes on a stark dabbling of several dark browns to define the subject in light and shadow. He does not blend his flesh tones in but leaves them boldly visible to the eye which has the effect of creating movement in his figures. The artist's final layers were always thickly applied and in rough detail. His whites are clear on the flesh tones and other features for lighting effects. 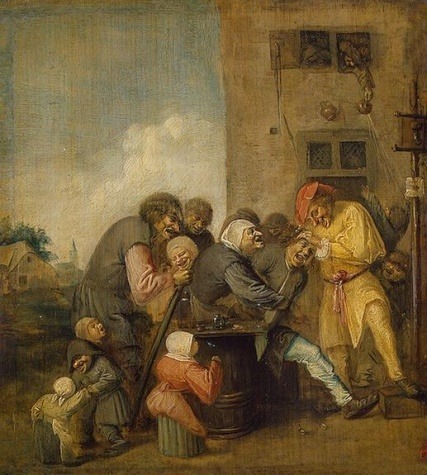 This technique can be strongly attributed to that of Frans Hals. Brouwer's brush work was bold and prominent and it can be assumed that he did most of his work at a fast pace, like his sketches. He seemed to press very hard upon the canvas and thickly applied his layers in bold movements especially in outlining the subject matter. For facial expressions he also used hard and dashing lines and the bristles of his brush are visible on the sitter's face. Subject matter further back in his images are not painted with such precise detail. 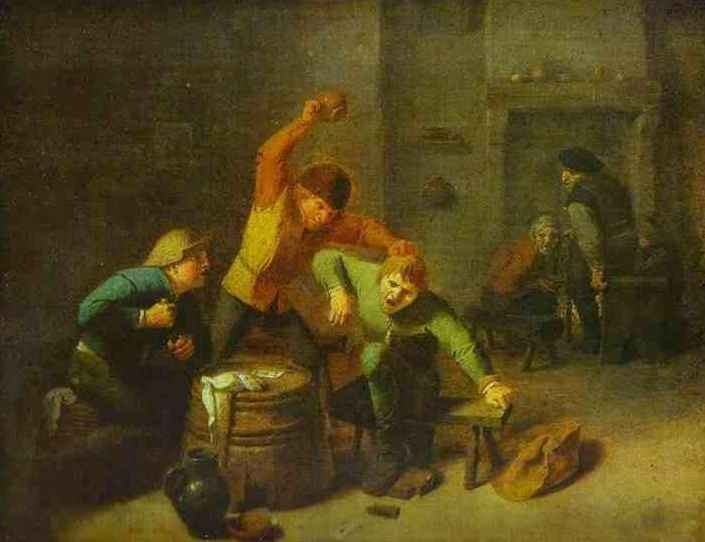 Brouwer believed his rough style created a more realistic depiction and suited the fast-paced events that took place in the taverns. However, his brush work is generally smooth in the finished work as his final layers looked to blend in all of the irregularities with a layer of light grey or brown to accentuate the smoky interior. 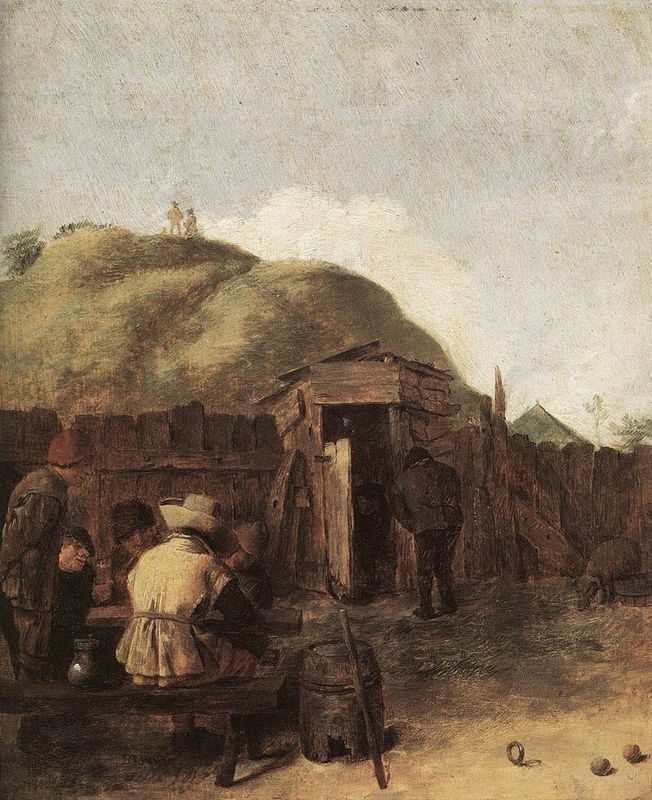 Brouwer's compositional techniques take on two forms as he changed his style of using the subject matter to create depth to more spacious scenes whereby he used objects, lighting techniques and colors to create depth instead. Like Hals, Brouwer enjoyed creating images with one side completely in darkness. This was not only done to recreate the dim setting of the fire-lit taverns but also to create depth. He added crevices and nooks in his walls to reaffirm the depth of the scene. 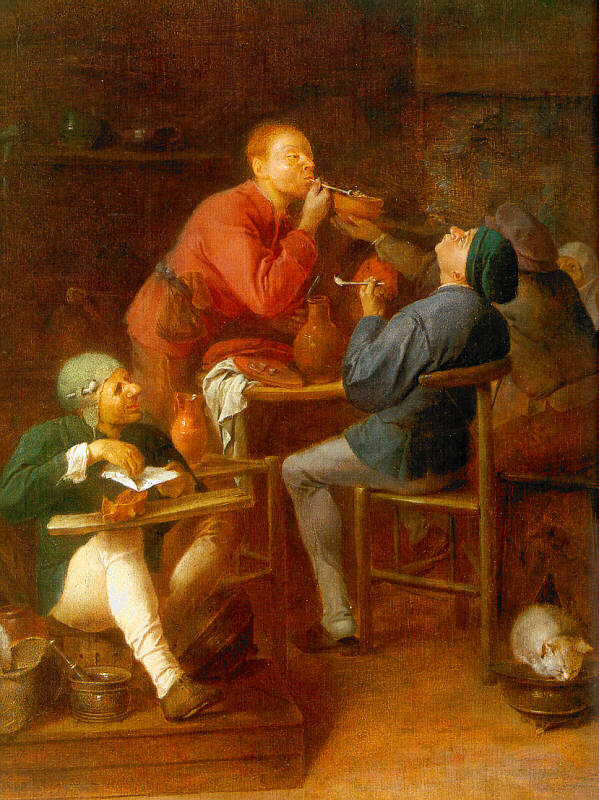 The artist's tavern scenes contained many subject matter engaged in immoral behaviour that took place on different slanted planes, as in the works of Rubens and Jordaens.